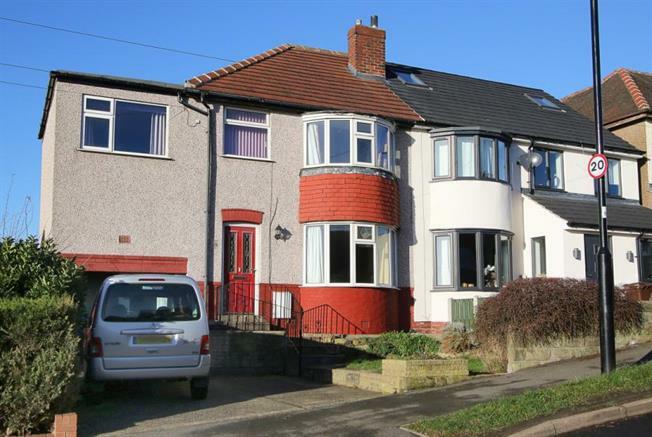 4 Bedroom Semi Detached House For Sale in Sheffield for £175,000. This property's price has dropped from £185,000 to £175,000. A deceptively spacious and well presented EXTENDED FOUR BEDROOM semi detached family home situated within the popular residential suburb of Charnock, offering a good level of accommodation throughout with a recently replaced attractive fitted dining kitchen, gas central heating and double glazing. Ideally placed for a wide variety of local shops/amenities, schools and transport links including the Supertram network, being the ideal purchase for any family looking to upsize within this desirable catchment. The accommodation in brief comprises: Entrance hall with stairs rising to the first floor landing, trap door to cellar/storage, under stair storage cupboard and a door leading into the bay fronted lounge, a door from the hall also leads into the open plan dining kitchen which provides a range of attractive high gloss cream wall and base units having granite work surfaces with built in pop up electrical points, along with integrated appliances to include: electric hob, electric double oven/grill, extractor fan, fridge/freezer, floor level dust extraction system and space/plumbing for a dishwasher. Rear facing patio style doors access the rear garden and a side facing entrance door also leads out on the rear garden and accesses the utility room/workshop having both front and rear facing entrance doors, along with space and plumbing for an automatic washing machine, tumble dryer and fridge/freezer, as well as access to storage in roof space. First floor landing with loft access with pull down ladder, power and lighting, master bedroom with wardrobes and built in storage/storage, double bedroom two with wardrobes and built in storage/storage, bedroom three and bedroom four also with built in storage. Family bathroom having a four piece suite in white comprising: wash hand basin, low flush wc, bidet and bath with electric shower and screen above. Outside: to the front of the property is double driveway providing off road parking with steps rising to the front elevation , whilst to the rear of the property is an enclosed mainly laid to lawn and well stocked garden with two flagged sitting areas, brick built storage shed and green house. Viewing is highly recommended to appreciate the overall accommodation on offer.